Peppered with some of the most extraordinary historical sites in the world, Athens' budding modern arts scene is almost enough to rival its archaeological counterparts, making it the perfect spot for both history buffs and art enthusiasts alike who are cruising on a superyacht from Athens to Rhodes. Where to visit: Yachts up to 70 metres can moor in the Flisvos Marina, which is a mere 20 minute drive from central Athens. Alternatively, yachts up to 130 metres can berth in the nearby Athens Marina. Situated just seven minutes from the two marinas, the new Stavros Niarchos Foundation Cultural Centre (SNFCC) is a must-see. Designed by architect Renzo Piano, this monumental and contemporary space is now home to the National Library of Greece, the Greek National Opera and extraordinary gardens, which feature a playground, outside gym, labyrinth, running track, vegetable plot and a number of walks and gardens. At the top of this architectural masterpiece is a large glass observatory, which hosts the solar panels that power the rest of the building. There are daily tours for visitors in addition to a myriad of music concerts, art exhibitions, film screenings and family events such as kids yoga and canal cruises. Heading into the centre of Athens, a visit to the Acropolis to see the Parthenon is virtually compulsory. Built using white Pentelic marble, it is the largest Doric temple completed in Greece and took 15 years to finish, just in time for the Great Panathenaic Festival of 438 BC. It served as the Treasury and was built on the site of a number of previous temples, also dedicated to Athena. The UNESCO World Heritage Site Acropolis below is a sprawling relic of the city of Pericles, which was first inhabited during the Neolithic era more than 5,000 years ago. 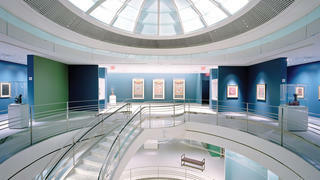 A myriad of museums and art galleries are scatted across the city. To continue exploring the past, head to the Acropolis Museum and the Benaki Museum, which boasts an incredible collection ranging from the Bronze Age to World War II. Alternatively, head over to the up and coming Metaxourgeio district to explore its contemporary art galleries. The Breeder Gallery, Vamiali's and the Rebecca Camhi Gallery are all worth seeing, as is the Avdi Square, which boasts a number of trendy restaurants. Where to eat: If you've ventured into Metaxourgeio, opt for one of the tasting menus at Aleria for Mediterranean dishes with a twist, such as feta cheese crème brûlée with watermelon pickle, croaker tartare and pasta with braised oxtail, shiitake and foamy béchamel. When in central Athens, Ama Laxei's traditional Greek dishes are the perfect option after a long day of sightseeing — relax in the stunning starlit courtyard and enjoy a selection of rich local wines. 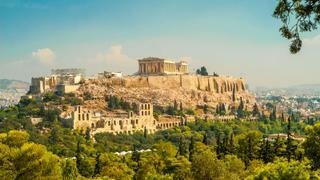 Peppered with some of the most extraordinary historical sites in the world, Athens' budding modern arts scene is almost enough to rival its archaeological counterparts, making it the perfect spot for both history buffs and art enthusiasts alike who are cruising on a superyacht from Athens to Rhodes. Where to visit: Yachts up to 70 metres can moor in the Flisvos Marina, which is a mere 20 minute drive from central Athens. Alternatively, yachts up to 130 metres can berth in the nearby Athens Marina. Situated just seven minutes from the two marinas, the new Stavros Niarchos Foundation Cultural Centre (SNFCC) is a must-see. Designed by architect Renzo Piano, this monumental and contemporary space is now home to the National Library of Greece, the Greek National Opera and extraordinary gardens, which feature a playground, outside gym, labyrinth, running track, vegetable plot and a number of walks and gardens. At the top of this architectural masterpiece is a large glass observatory, which hosts the solar panels that power the rest of the building. There are daily tours for visitors in addition to a myriad of music concerts, art exhibitions, film screenings and family events such as kids yoga and canal cruises. Heading into the centre of Athens, a visit to the Acropolis to see the Parthenon is virtually compulsory. Built using white Pentelic marble, it is the largest Doric temple completed in Greece and took 15 years to finish, just in time for the Great Panathenaic Festival of 438 BC. It served as the Treasury and was built on the site of a number of previous temples, also dedicated to Athena. The UNESCO World Heritage Site Acropolis below is a sprawling relic of the city of Pericles, which was first inhabited during the Neolithic era more than 5,000 years ago. A myriad of museums and art galleries are scatted across the city. To continue exploring the past, head to the Acropolis Museum and the Benaki Museum, which boasts an incredible collection ranging from the Bronze Age to World War II. Alternatively, head over to the up and coming Metaxourgeio district to explore its contemporary art galleries. The Breeder Gallery, Vamiali's and the Rebecca Camhi Gallery are all worth seeing, as is the Avdi Square, which boasts a number of trendy restaurants. Where to eat: If you've ventured into Metaxourgeio, opt for one of the tasting menus at Aleria for Mediterranean dishes with a twist, such as feta cheese crème brûlée with watermelon pickle, croaker tartare and pasta with braised oxtail, shiitake and foamy béchamel. When in central Athens, Ama Laxei's traditional Greek dishes are the perfect option after a long day of sightseeing — relax in the stunning starlit courtyard and enjoy a selection of rich local wines. In recent years, Lisbon has been dubbed the next big destination in terms of art and culture. Steeped in history and local traditions, it's myriad of museums, galleries, fine dining restaurants and historical sites will ensure that all city-loving globetrotters leave well satiated. Where to visit: From your berth in Lisbon Harbour (Porto de Lisboa) walk or take a private car to the nearby Museum of Art, Architecture and Technology (MAAT). The building, which is a curvaceous and artistic triumph in itself, sits on the waterfront and officially opened its doors to the public on October 5, 2016. The exhibitions are varied, examining topics using almost every medium, from visual arts and cinema to interactive spaces and fine art. Later this year, it will feature the Utopia/Dystopia "manifesto exhibition" featuring more than 60 projects and artworks that offer views on these two narratives. From here, carry on to the famous UNESCO World Heritage Site, the Mosteiro dos Jerónimos. Built over the course of a century from 1501, it is an architectural masterpiece of late Gothic Portuguese design. From here you can easily visit the Torre de Belém, an early 16th century fortified tower built in the same style as the monastery. Another day, set off from your berth in the opposite direction to visit the Museu Nacional de Arte Antiga (MNAA), which is home to a vast public collection of more than 40,000 items. Peruse the historical artefacts, paintings, sculptures gold and silver pieces inside an equally significant building painted in a vibrant lemon yellow. The MNAA is located in the former palace of the first Count of Alvor that was built in the late 17th century. Continue east to the Castelo de São Jorge, an 11th century fortification that acted as the home for royalty and the elite from the 13th century until the 17th century. Finally, take a car up to the Museu Calouste Gulbenkian, to see a diverse range of art collections from all over the world as well as an impressive network of beautiful gardens and perhaps even a classical music concert. If you're willing to travel slightly further afield, the medieval town of Óbidos north of Lisbon is not to be missed, as over recent years it has been transformed into a literary hub, with bookshops popping up in hotels, restaurants and even the pews of the 13th century Church of Santiago. Unsurprisingly, UNESCO named it a City of Literature in 2015. Where to eat: A short stroll from the Torre de Belém is Feitoria, a Michelin-starred restaurant with views of the river and three tasting menus of traditional Portuguese cuisine. Alternatively, head to Alma — also Michelin-starred, it offers Asian-inspired tasting menus, each with its own unique twist. In recent years, Lisbon has been dubbed the next big destination in terms of art and culture. Steeped in history and local traditions, it's myriad of museums, galleries, fine dining restaurants and historical sites will ensure that all city-loving globetrotters leave well satiated. 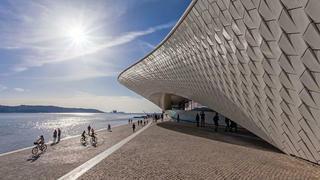 Where to visit: From your berth in Lisbon Harbour (Porto de Lisboa) walk or take a private car to the nearby Museum of Art, Architecture and Technology (MAAT). The building, which is a curvaceous and artistic triumph in itself, sits on the waterfront and officially opened its doors to the public on October 5, 2016. The exhibitions are varied, examining topics using almost every medium, from visual arts and cinema to interactive spaces and fine art. Later this year, it will feature the Utopia/Dystopia "manifesto exhibition" featuring more than 60 projects and artworks that offer views on these two narratives. From here, carry on to the famous UNESCO World Heritage Site, the Mosteiro dos Jerónimos. Built over the course of a century from 1501, it is an architectural masterpiece of late Gothic Portuguese design. From here you can easily visit the Torre de Belém, an early 16th century fortified tower built in the same style as the monastery. Another day, set off from your berth in the opposite direction to visit the Museu Nacional de Arte Antiga (MNAA), which is home to a vast public collection of more than 40,000 items. Peruse the historical artefacts, paintings, sculptures gold and silver pieces inside an equally significant building painted in a vibrant lemon yellow. The MNAA is located in the former palace of the first Count of Alvor that was built in the late 17th century. Continue east to the Castelo de São Jorge, an 11th century fortification that acted as the home for royalty and the elite from the 13th century until the 17th century. Finally, take a car up to the Museu Calouste Gulbenkian, to see a diverse range of art collections from all over the world as well as an impressive network of beautiful gardens and perhaps even a classical music concert. If you're willing to travel slightly further afield, the medieval town of Óbidos north of Lisbon is not to be missed, as over recent years it has been transformed into a literary hub, with bookshops popping up in hotels, restaurants and even the pews of the 13th century Church of Santiago. Unsurprisingly, UNESCO named it a City of Literature in 2015. Where to eat: A short stroll from the Torre de Belém is Feitoria, a Michelin-starred restaurant with views of the river and three tasting menus of traditional Portuguese cuisine. Alternatively, head to Alma — also Michelin-starred, it offers Asian-inspired tasting menus, each with its own unique twist. While modernist Catalan architect Antoni Gaudí’s seven World Heritage-listed works (and seven additional basic works) definitely aren’t Barcelona’s only artistic draw, they are essential to any itinerary in the Catalan capital. And as Gaudí (1852-1926) was an avid walker (it suppressed his rheumatism while the curves of nature inspired his work), ambling between his masterpieces is somehow even more appropriate and a must if you're spending at least 24 hours in Barcelona away from your superyacht. *Where to visit: *Your berth at OneOcean Port Vell is a short walk from Palau Güell, the palace of Eusebi Güell, Gaudí’s main patron. Continue north west up La Rambla and several blocks beyond it to Casa Batlló, arguably Gaudí’s most magical creation, with its fantastic façade, a roof in the shape of an animal’s back and a dreamy underwater atmosphere inside. A few blocks farther is Casa Milà, commonly known as La Pedrera (“the stone quarry”). Another day, continue northeast to Gaudí’s final project, the unfinished Sagrada Família, an enormous Roman Catholic basilica that might finally be completed within the first third of the 21st century. From here, hail a taxi to Park Güell, with its pink Casa Museu Gaudí (Gaudí House Museum), where the architect lived for 20 years. Other notable Barcelona museums include the Museu Picasso, a reference for understanding Pablo Picasso’s formative years; the Fundació Joan Miró, a center featuring Catalan painter, sculptor and ceramicist Joan Miró’s work, as well as other cutting-edge contemporary artists; the Museu d’Art Contemporani de Barcelona; the Museu del Modernisme de Barcelona, which specializes in Catalan modernism; and the Fundació Antoni Tàpies. *Where to eat: *Two Michelin-star Arola, a restaurant with sea views inside the Hotel Arts Barcelona building, presents Chef Sergi Arola’s imaginative interpretations of traditional Mediterranean cuisine, focusing on tapas-style dishes such as spicy patatas bravas and mixed crab with minced egg and tomatoes. While modernist Catalan architect Antoni Gaudí’s seven World Heritage-listed works (and seven additional basic works) definitely aren’t Barcelona’s only artistic draw, they are essential to any itinerary in the Catalan capital. 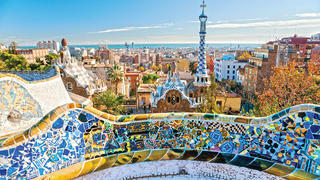 And as Gaudí (1852-1926) was an avid walker (it suppressed his rheumatism while the curves of nature inspired his work), ambling between his masterpieces is somehow even more appropriate and a must if you're spending at least 24 hours in Barcelona away from your superyacht. *Where to visit: *Your berth at OneOcean Port Vell is a short walk from Palau Güell, the palace of Eusebi Güell, Gaudí’s main patron. Continue north west up La Rambla and several blocks beyond it to Casa Batlló, arguably Gaudí’s most magical creation, with its fantastic façade, a roof in the shape of an animal’s back and a dreamy underwater atmosphere inside. A few blocks farther is Casa Milà, commonly known as La Pedrera (“the stone quarry”). Another day, continue northeast to Gaudí’s final project, the unfinished Sagrada Família, an enormous Roman Catholic basilica that might finally be completed within the first third of the 21st century. From here, hail a taxi to Park Güell, with its pink Casa Museu Gaudí (Gaudí House Museum), where the architect lived for 20 years. Other notable Barcelona museums include the Museu Picasso, a reference for understanding Pablo Picasso’s formative years; the Fundació Joan Miró, a center featuring Catalan painter, sculptor and ceramicist Joan Miró’s work, as well as other cutting-edge contemporary artists; the Museu d’Art Contemporani de Barcelona; the Museu del Modernisme de Barcelona, which specializes in Catalan modernism; and the Fundació Antoni Tàpies. *Where to eat: *Two Michelin-star Arola, a restaurant with sea views inside the Hotel Arts Barcelona building, presents Chef Sergi Arola’s imaginative interpretations of traditional Mediterranean cuisine, focusing on tapas-style dishes such as spicy patatas bravas and mixed crab with minced egg and tomatoes. If you're tired of London, one of the best places to spend Christmas, you might be tired of life — or you might just be exhausted from visiting this glorious city’s abundance of art museums. So perhaps it’s better to pick just a few… *Where to visit: *From your berth at St. Katharine Docks, next to the Tower of London and Tower Bridge, begin an art-focused exploration with a lengthy wander west along the Thames to Somerset House, just shy of Waterloo Bridge. This Neoclassical building, completed in 1553, has royal — and Tower — links. In 1547, soon after Henry VIII’s death, Edward Seymour (the eldest brother of the late king’s third wife) had himself deemed Lord Protector and Duke of Somerset and began building himself a palace. Seymour was executed on Tower Hill for treason before its completion, but Princess Elizabeth called it home until she took the throne in 1558. Today, its Courtauld Gallery includes iconic works by Manet, Degas, Monet, Van Gogh, Cézanne and Gauguin, while its Embankment Galleries features contemporary exhibitions such as Hair by Sam McKnight (until March 12, 2017), which celebrates the career of the master hairstylist who helped develop the images of Kate Moss, Princess Diana and others. Afterwards, continue west along the Strand to the National Gallery, home to more than 2,000 Western European paintings. Next door, the National Portrait Gallery houses over 200,000 portraits — drawings, paintings, photographs and such — from Anne Boleyn to David Bowie and Emily Blunt. While you could easily fill a week visiting London’s other well-known museums — the Tate Britain, the Tate Modern and the Saatchi Gallery, for starters — check out other spaces as well. Newport Street Gallery in Vauxhall displays artist Damien Hirst’s collection and Leighton House Museum in Kensington contains works by Victorian artist Lord Frederic Leighton (1830-1896) and his contemporaries. *Where to eat: *Set over two floors of a converted 18th-century building in Mayfair, Sketch’s three restaurants include the two Michelin-star Lecture Room & Library, with menus conceived by French Master chef Pierre Gagnaire, and the Gallery, which features 239 works by celebrated British artist David Shrigley. *Where to drink: *At the National Portrait Gallery’s rooftop Portrait Restaurant, you’ll enjoy views across the London skyline while sipping a God Save the Queen martini (Hendrick’s gin, elderflower liqueur, fresh-pressed cranberry juice and lemon juice). Additionally, at the Serpentine Sackler Gallery’s The Magazine Restaurant, you can toast your cultured self with a Magazine Bellini, created with homemade limoncello, white peach and thyme topped with Prosecco. 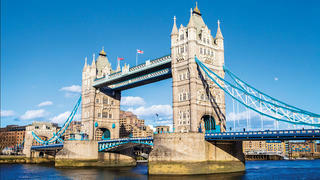 *Where to visit: *From your berth at St. Katharine Docks, next to the Tower of London and Tower Bridge, begin an art-focused exploration with a lengthy wander west along the Thames to Somerset House, just shy of Waterloo Bridge. This Neoclassical building, completed in 1553, has royal — and Tower — links. In 1547, soon after Henry VIII’s death, Edward Seymour (the eldest brother of the late king’s third wife) had himself deemed Lord Protector and Duke of Somerset and began building himself a palace. Seymour was executed on Tower Hill for treason before its completion, but Princess Elizabeth called it home until she took the throne in 1558. Today, its Courtauld Gallery includes iconic works by Manet, Degas, Monet, Van Gogh, Cézanne and Gauguin, while its Embankment Galleries features contemporary exhibitions such as Hair by Sam McKnight (until March 12, 2017), which celebrates the career of the master hairstylist who helped develop the images of Kate Moss, Princess Diana and others. Afterwards, continue west along the Strand to the National Gallery, home to more than 2,000 Western European paintings. Next door, the National Portrait Gallery houses over 200,000 portraits — drawings, paintings, photographs and such — from Anne Boleyn to David Bowie and Emily Blunt. While you could easily fill a week visiting London’s other well-known museums — the Tate Britain, the Tate Modern and the Saatchi Gallery, for starters — check out other spaces as well. Newport Street Gallery in Vauxhall displays artist Damien Hirst’s collection and Leighton House Museum in Kensington contains works by Victorian artist Lord Frederic Leighton (1830-1896) and his contemporaries. *Where to eat: *Set over two floors of a converted 18th-century building in Mayfair, Sketch’s three restaurants include the two Michelin-star Lecture Room & Library, with menus conceived by French Master chef Pierre Gagnaire, and the Gallery, which features 239 works by celebrated British artist David Shrigley. *Where to drink: *At the National Portrait Gallery’s rooftop Portrait Restaurant, you’ll enjoy views across the London skyline while sipping a God Save the Queen martini (Hendrick’s gin, elderflower liqueur, fresh-pressed cranberry juice and lemon juice). Additionally, at the Serpentine Sackler Gallery’s The Magazine Restaurant, you can toast your cultured self with a Magazine Bellini, created with homemade limoncello, white peach and thyme topped with Prosecco. If Art Basel wasn't enough to satisfy you, charter in New York City and hundreds of art galleries are just a short tender or taxi ride away — in Soho, the Village, the Lower and Upper East Sides, on 57th street in Midtown and particularly in Chelsea, which is home to approximately 350 spaces. *Where to visit: *From your berth at North Cove Marina at Brookfield Place, just west of the 9/11 Memorial, tender north to Chelsea Piers; from here, it’s a quick walk to several iconic Chelsea galleries. Through December 17, for example, you can peruse William Eggleston’s “Selected Works from The Democratic Forest” at the David Zwirner Gallery on West 19th Street. On West 18th is 2,294 square metre Hauser & Wirth, housed in former nightclub The Roxy, as well as Petzel, which develops its program around internationally renowned contemporary artists. To the north are two of the city’s five Gagosian galleries, two Andrea Rosen locations and three of Pace Gallery’s spaces, which host large-scale as well as more intimate exhibitions. After pausing for a Bronx American Pale Ale and a snack at The Half King, co-owned by The Perfect Storm author Sebastian Junger, consider exploring the Rubin Museum of Art, which features ancient and modern Himalayan artwork, or the Whitney Museum of American Art, just south of Chelsea in the Meatpacking District. You may wish to return to Chelsea another day to delve further into its prolific art scene, although the city’s museums — the Metropolitan Museum of Art, the Guggenheim and the Frick Collection, just to name a few — are likely to distract you as well. *Where to eat: *Overlooking the MoMA’s Abby Aldrich Rockefeller Sculpture Garden is two Michelin-star The Modern, featuring contemporary cuisine by Abram Bissell. Three or four courses — king crab marinated with green tomato, roasted lobster potage and basil mascarpone, perhaps — are sure to enhance your threshold for art appreciation. If Art Basel wasn't enough to satisfy you, charter in New York City and hundreds of art galleries are just a short tender or taxi ride away — in Soho, the Village, the Lower and Upper East Sides, on 57th street in Midtown and particularly in Chelsea, which is home to approximately 350 spaces. *Where to visit: *From your berth at North Cove Marina at Brookfield Place, just west of the 9/11 Memorial, tender north to Chelsea Piers; from here, it’s a quick walk to several iconic Chelsea galleries. Through December 17, for example, you can peruse William Eggleston’s “Selected Works from The Democratic Forest” at the David Zwirner Gallery on West 19th Street. On West 18th is 2,294 square metre Hauser & Wirth, housed in former nightclub The Roxy, as well as Petzel, which develops its program around internationally renowned contemporary artists. To the north are two of the city’s five Gagosian galleries, two Andrea Rosen locations and three of Pace Gallery’s spaces, which host large-scale as well as more intimate exhibitions. After pausing for a Bronx American Pale Ale and a snack at The Half King, co-owned by The Perfect Storm author Sebastian Junger, consider exploring the Rubin Museum of Art, which features ancient and modern Himalayan artwork, or the Whitney Museum of American Art, just south of Chelsea in the Meatpacking District. You may wish to return to Chelsea another day to delve further into its prolific art scene, although the city’s museums — the Metropolitan Museum of Art, the Guggenheim and the Frick Collection, just to name a few — are likely to distract you as well. *Where to eat: *Overlooking the MoMA’s Abby Aldrich Rockefeller Sculpture Garden is two Michelin-star The Modern, featuring contemporary cuisine by Abram Bissell. Three or four courses — king crab marinated with green tomato, roasted lobster potage and basil mascarpone, perhaps — are sure to enhance your threshold for art appreciation.